Karl Theodor Jaspers (German: [ˈjaspɐs]; 23 Februar 1883 – 26 Februar 1969) wis a German-Swiss psychiatrist an filosofer wha haed a strang influence on modren theology, psychiatry, an filosofie. Efter bein trained in an practicin psychiatry, Jaspers turned tae filosofical inquiry an attemptit tae discover an innovative filosofical seestem. He wis eften viewed as a major exponent o exeestentialism in Germany, tho he did nae accept this label. ↑ 1.0 1.1 1.2 1.3 Karl Jaspers. Stanford Encyclopedia of Philosophy. 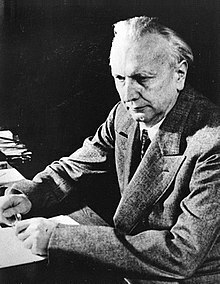 ↑ Ernesto Spinelli, Practising Existential Psychotherapy: The Relational World, SAGE, 2007, p. 52: "Karl Jaspers can be considered to be among the earliest direct attempts to apply existential phenomenology to psychotherapy". This page wis last eeditit on 26 August 2016, at 22:52.